SALZBURG, AUSTRIA: Salzburg is the city of music for being the birthplace of Mozart and where the famous movie “Sound of Music” was filmed in the 1960s. Mozart and Julie Andrews both made this city a major attraction for many tourists worldwide. Situated beautifully by River Salzach, Salzburg is one of the most spectacular cities in Europe and one of my most favorite places to visit. I will pick Salzburg over Vienna anytime for its architecture, medieval look, cozy atmosphere, and elegant vibe. This is a city, I sometimes crave to go to and just enjoy its rich history and culture. 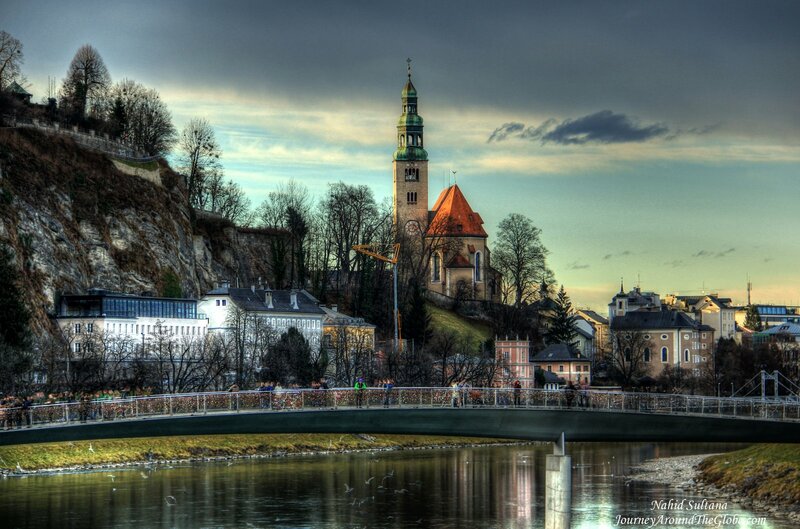 Salzburg is very close to German border and has one of the best-preserved city center in the German-speaking world. The old town with many Baroque architectures, became a UNESCO World Heritage Site in 1997. 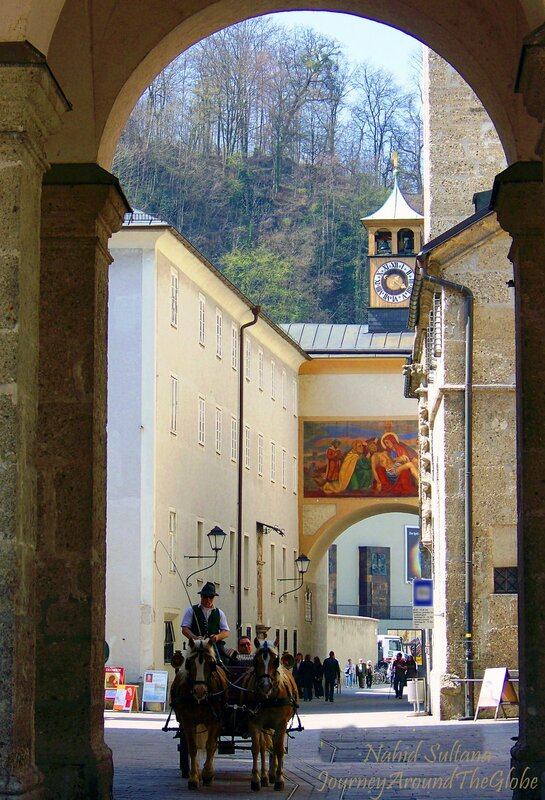 You can never get bored in Salzburg with so many museums, marionette theaters, old churches and landmarks to visit, and a perfect cozy old town with endearing surroundings. 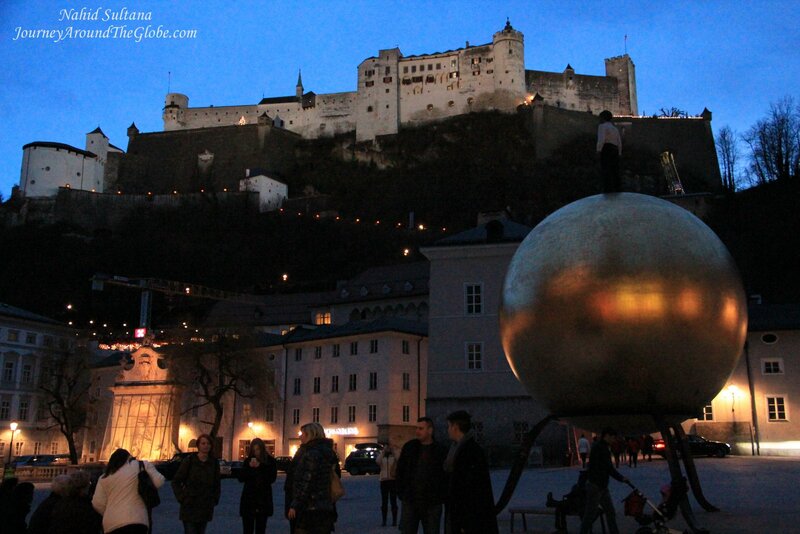 TIME of TRAVEL: Salzburg was the 3rd destination of our winter road trip in December 2013. My uncle-in-law was here to escape the below freezing temperatures in Chicago and also to spend few weeks with us. The whole trip was for 12 days. 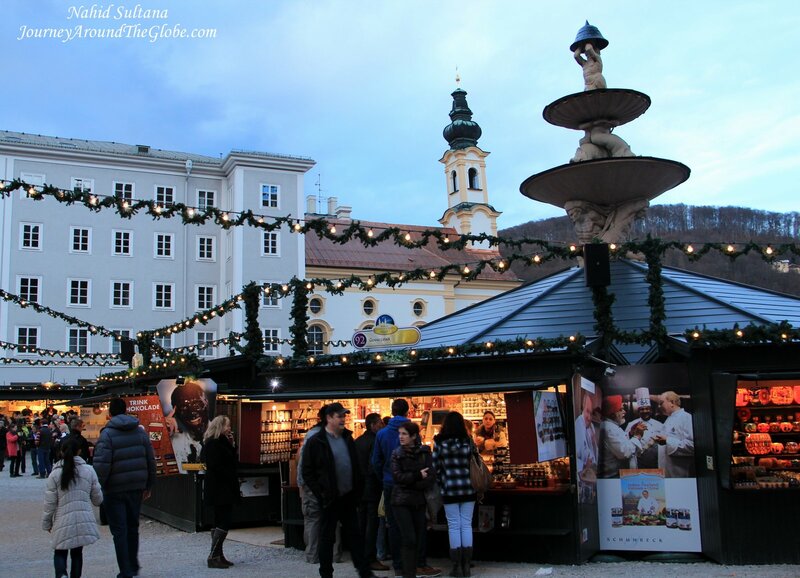 After visiting Fussen in Germany and Innsbruck in Austria, we reached Salzburg on the Christmas Eve. Weather was very mild to my surprise. I was prepared for some harsh cold temperature during Christmas for being so close to the Alps, but it was very nice, may be early to mid-40s during day and early 30s after dark…not bad at all. By the way, this was our second time coming to this city. We have been here during Easter Break of 2009, when we were still living in the US. That time we toured around Europe for 2 weeks. I was longing to come back to Salzburg since then and finally it happened last month. 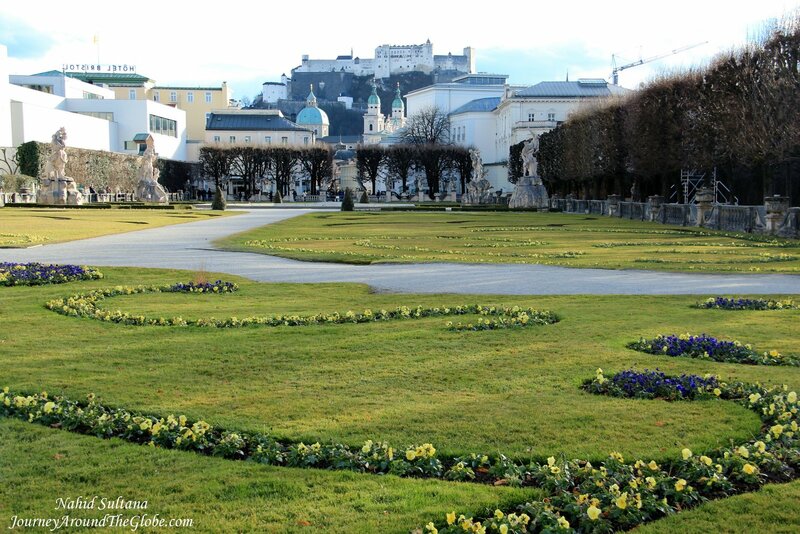 Easter in Salzburg (or may be in whole Europe) is absolutely magical…it’s like Christmas in The States. 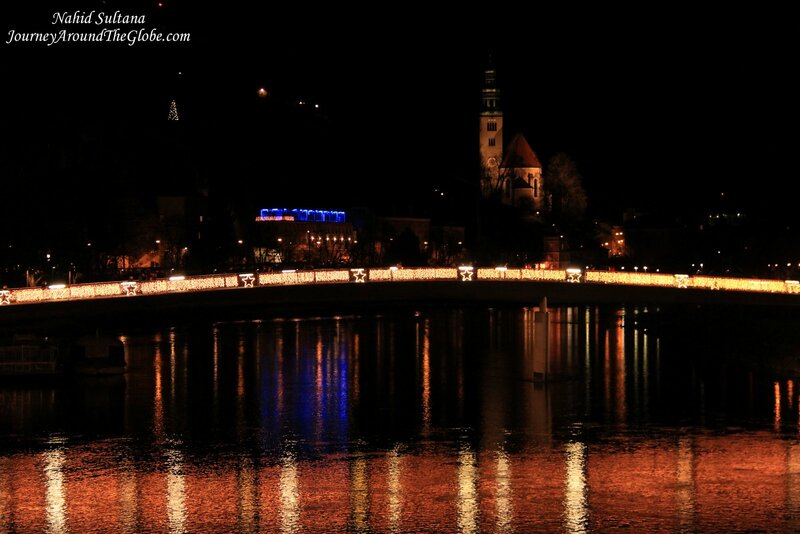 Whole old town Salzburg was sparkling with lights and egg-decors. I have never seen Easter being celebrated with that enthusiasm before. I have posted pictures from both of our trips, so you can see what the city looks like in spring and in winter. Excuse the big ol’ yellow dates on the old pictures. OUR HOTEL: We stayed in Hotel Der Salzburger Hof in one side of Mirabel Palace, but was little away from the old town. It had its own restaurant, free breakfast and Wi-Fi for the guests. But the best part of this hotel was that each floor of it was designed in different theme. Like, one floor was in Mozart theme and ours was in “Sound of Music” theme. Our room even had some scenes from the movie printed on the wall. In 2009, we stayed closer to city center, in Hotel Austrotel, which is now called Hotel Am Mirabellplatz. This one didn’t have breakfast but has a bakery at the end of the street. Whole old town of Salzburg is packed with tons of souvenir shops. 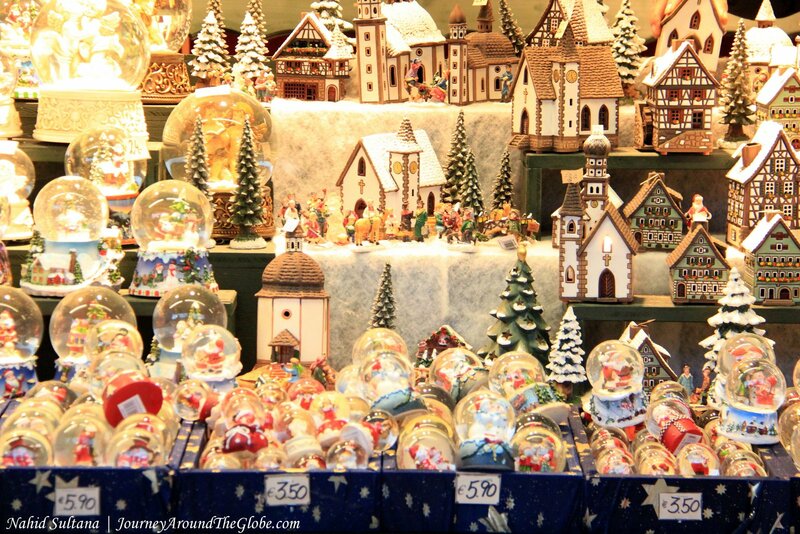 Browse thru the small stands in Alter Markt or other fancy stores in the old alleys. On our first visit in 2009, we bought a decorative Bavarian beer mug (can be pretty expensive depending on the size). This time my husband bought a Tyrolean hat (very traditional here) with a feather on it…looks a bit like Robinhood’s hat; he regretted very much that he didn’t buy it in 2009. For our home, I got some small this and that from the huge Christmas market in Residenzplatz and Domplatz. The annual Christmas market is here very big and colorful here. Even if you don’t buy anything just come and join the fun, may be try some local knickknacks too. Also, marionettes are very popular here and you will find them in almost everywhere in old town. 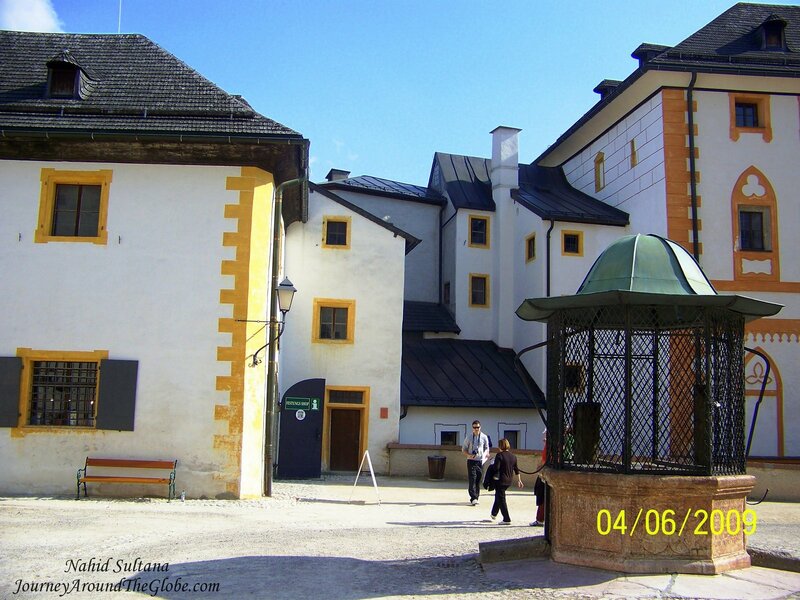 While you are in Mozart’s town, buy his classical CDs or other memorabilia. 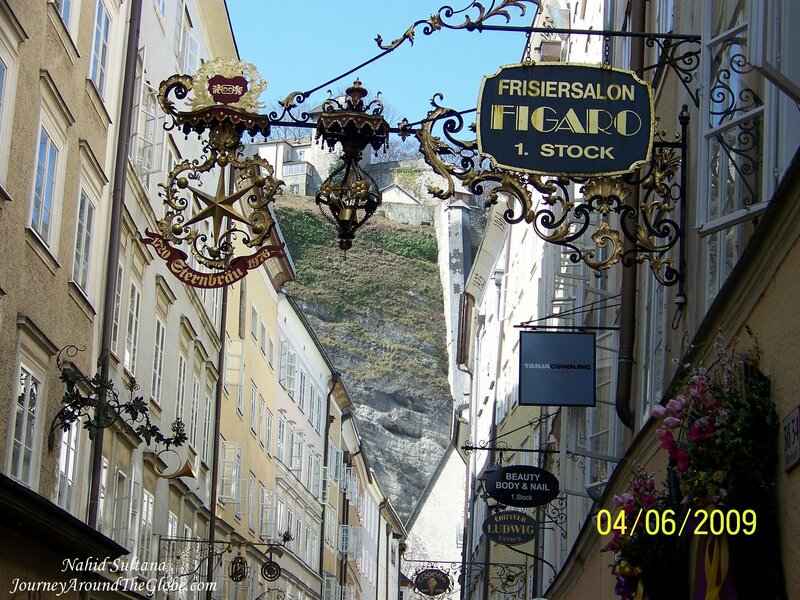 PLACES WE’VE VISITED: We spent two whole days in Salzburg during our first visit in 2009. But this time we took “Sound of Music” tour in the morning; so we were left with only half a day to spend in the city. We were dropped off near Mirabel Garden around 1:30pm by the tour bus and then we were off to venture Mozart’s city. Old town is very compact; take your time to absorb its appealing atmosphere. We did everything on foot and it was fun doing it that way. If you are done with the city and have more time, then try going to the lake-district, close to the mountains…few km away from Salzburg. If you have your own car, it takes about half an hour to reach there. It’s a perfect region for summer tourists and makes a nice getaway from the city-life and of course you will love its stunning natural beauty with lakes, mountains, and villages. 1) MIRABEL GARDEN and PALACE: We started our walk from Mirabel Garden and Palace. We didn’t really go inside the palace because I don’t think it is open to the publics for regular tours. It is said that Mirabel Palace has world’s most beautiful wedding hall and need to be reserved at least a year ahead. We walked via its garden towards Salzach River. Beginning of early spring, this garden looks at its best with fresh flowers and a big fountain in the middle surrounded by sculptures on the four sides. But we didn’t really see any flowers this time. The fountain was not on either. But it is a nice place to stroll around and sit down to take a little break. Mirabel Palace is located in Mirabellplatz, little bit away from old town. The walk is only about 10 minutes from old town but very close to Mozart Residence. 2) GETREIDEGASSE: After crossing a bridge on River Salzach from Mozart’s Residence/Wohnhaus we crossed the street and entered the old town. This is a long and narrow street here with full of shops and souvenir places. Stores on Getreidegasse still decorate their entrances with metal signs of what their stores are about, just like the old times. This can be a very crowded place to walk around but I guess that’s why I loved strolling up and down this street. 3) MOZART’S BIRTHPLACE (MOZARTS GEBURTHAUS) and MUSEUM: On Getreidegasse, a bright yellow house stands amongst some other old buildings from few centuries ago. The famous composer Wolfgang Amadeus Mozart was born in this house in 1756 and lived here until 1773. Now it’s a popular museum devoted to his life, work, and family. 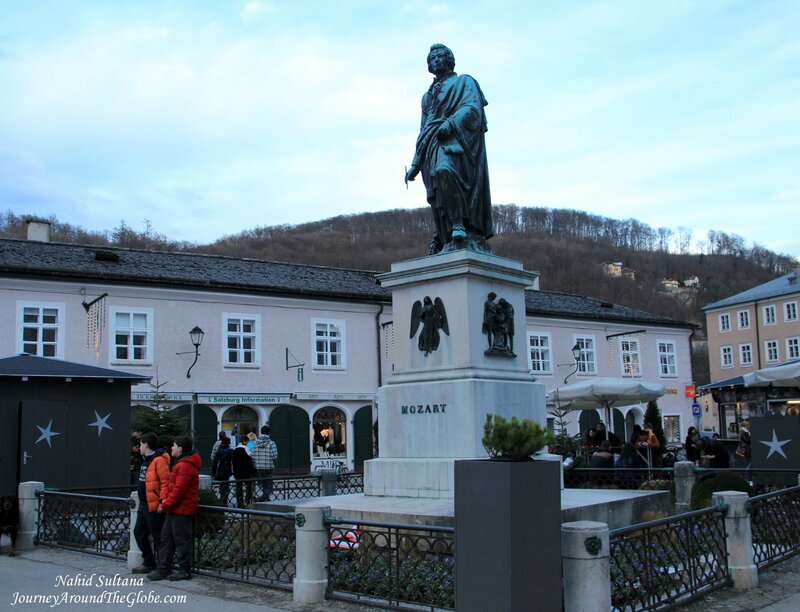 Mozart is a major attraction of Salzburg and his birthplace is a site which his fans wouldn’t want to miss. This museum (along with Mozart Wohnhaus) has the largest collection of Mozartiana worldwide. This is a very special experience – to see, hear, and absorb the atmosphere of the place where Mozart was born and spent his childhood. In this three level exhibition, the visitors can learn details of his life including domestic circumstances, when he began to play music, his relationship with his family, his passion for opera, and much more. Besides original portraits and documents, there are some rare exhibits from Mozart’s possessions, such as the violin he played as a child and an authentic portrait which was painted two years before his death. The museum is open daily (including Sundays and holidays) from 9am to 5:30pm and in July and August from 9am to 8pm. You can buy combine tickets for Mozart’s Birthplace and Mozart Residence in any one of these museums for a discounted price. 4) MOZART WOHNHAUS or MOZART RESIDENCE: Also known as the “Dancing Master’s House”, the former residence of the Mozart family stands on the right bank of Salzach River. Like Mozart’s Birthplace, this house is one of the most important memorial sites in Salzburg. By the fall of 1773, the rooms of Getreidegasse had become too small for the Mozarts. The family moved here in 1773 and Mozart himself lived here until 1780. His father died in this apartment in 1787. You can see the rooms used by the Mozart Family and the composer himself. The building was largely destroyed during WWII but was reconstructed according to the original plan to reopen it as a second Mozart museum. Mozart’s own piano, music notes, and some portraits are some particular attractions here. His audio-visual collections, in addition to the exhibitions, contain sound and film recordings concerning the life and works of Mozart – some 22,000 audio and 2,800 video recordings. 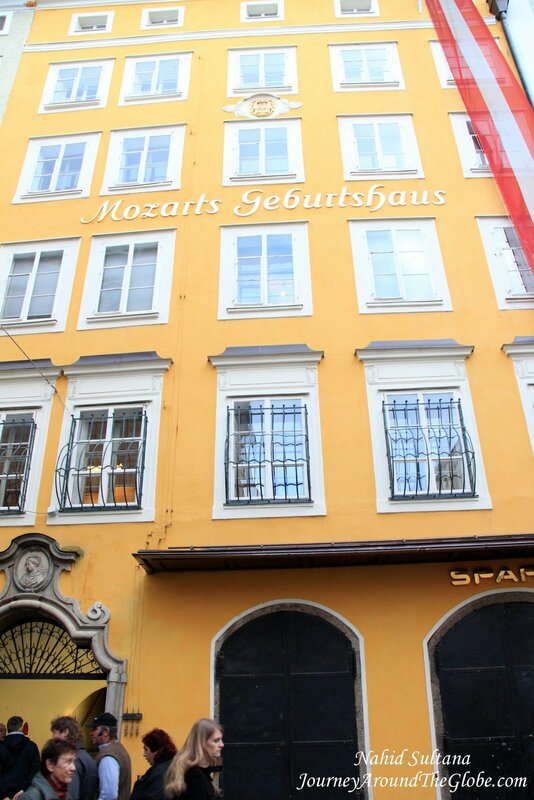 Mozart Residence is located in Makartplatz, only 5 minutes of walk from his birthplace and opposite of Mirabel Garden. The museum is open daily (including Sundays and holidays) from 9am to 5:30pm and in July and August from 9am to 8pm. You can buy combine tickets for 12 euros per person for Mozart’s Birthplace and Mozart Residence in any one of these museums for a discounted price. 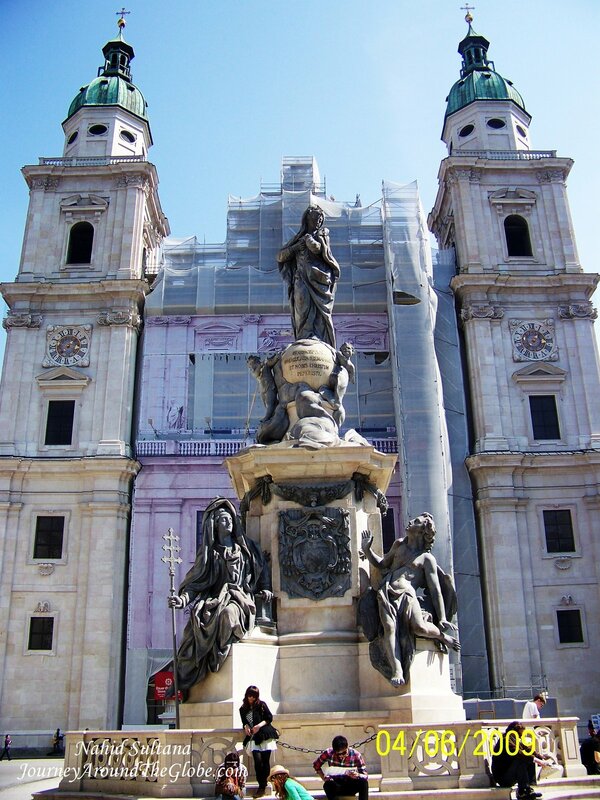 5) MOZARTPLATZ: This square is dedicated to Salzburg’s talented son, Mozart. A statue of young Mozart stands in the middle here. There was an ice-rink in the middle of the square when we were there in December. Many souvenir shops are here too. 6) RESIDENZPLATZ: Right beside Mozartplatz is Residenzplatz. 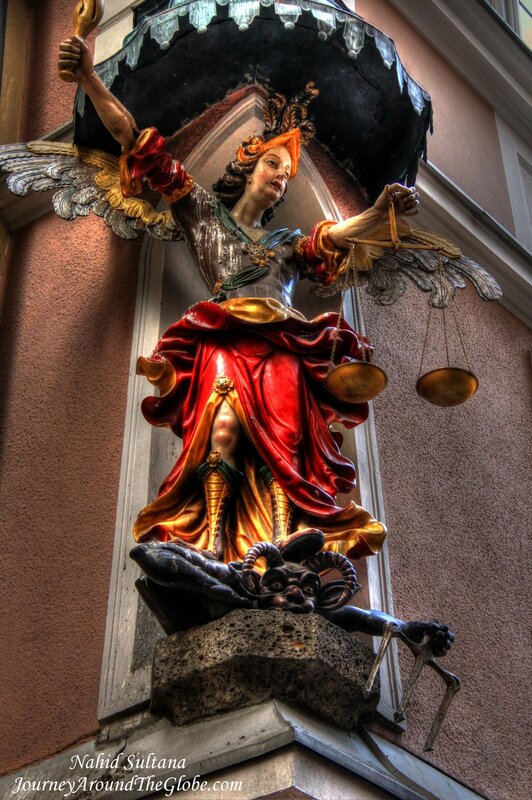 St. Michaels Church in Residenzplatz is an old church. It’s a small but beautiful church inside. We didn’t find it open on our 2nd visit but outside the church is very nice too. You can get horse-carriages from Residenzplatz to tour around the old town. Salzburg Museum and Residence Gallery are located in this platz. Christmas market here was one of the gorgeous ones I’ve seen so far. 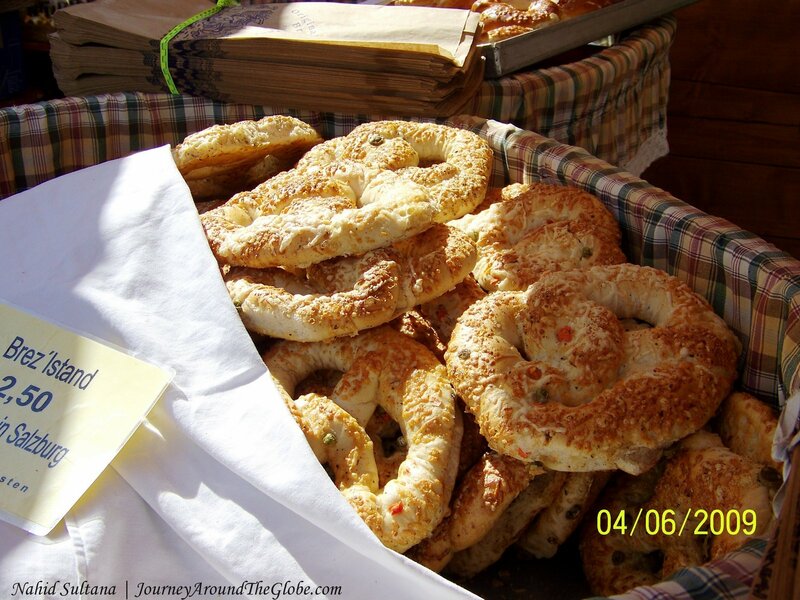 The place was bustling with many tourists and locals – everyone enjoying hot drinks, snacks, sweet treats, and of course doing little shopping along the way. This is probably one of the best places to try some local fresh finger-foods (same goes for the market in Domplatz). 7) DOMPLATZ and SALZBURG DOME CATHEDRAL: After passing Residenzplatz take few steps and you are in Domplatz. 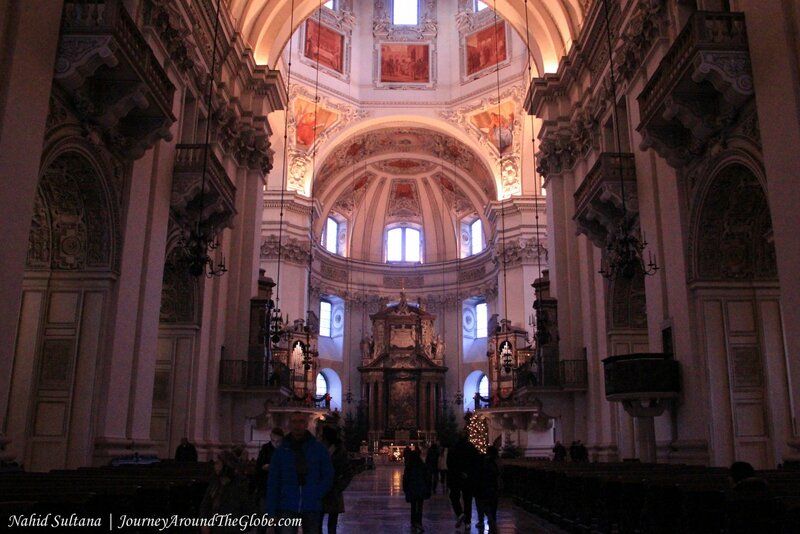 Dome Cathedral is one of the grandest architectures in whole of Salzburg. It’s an attractive cathedral both outside and inside. You will just love its high dome, impressive ceiling, majestic organ, old frescoes, and large biblical paintings. I think there is a fee to get inside but it was free on the Christmas Day. Domplatz also had a big Christmas market in front of the cathedral. It was also sparkling and dazzling with lights and decors. We bought some brezens (pretzel-like snack) from here and cotton candies for the kids while enjoying this big gathering. When we were here in April of 2009, the square was empty and quiet. There is a beautiful fountain in the middle of the square right in front of the cathedral. 8) CAPITALPLATZ: Another few steps and on the left side of the cathedral is Capitalplatz. You can see Hohensalzburg Fortress on the hill from all the above squares but the closest view is from here. There is a big fountain in one side of this square right below Hohensalzburg. Play the giant chess if you ever get a chance or watch other people playing it. 9) ST. PETER’S CHURCH and CEMETERY: We didn’t go to this church this time. But I remember going there on our first trip. It’s another beautiful church of Salzburg. Can’t remember which square it is situated in, but it was a gorgeous church outside and inside. Before we reached the church, we saw St. Peter Cemetery. This is a really old cemetery and a very calm place. You can see many few hundred years old tombs. 10) HOHENSALZBURG FORTRESS (FESTUNG): This fortress is like the guardian of Salzburg looking over the city all the time. It’s located on top of a small mountain and can be seen from almost any point of Salzburg, far or close. The fortress was built in 1077 and expanded in the following centuries. We didn’t’ go to up to the fortress this time. If I can remember correctly from our first visit, there are couple museums there and one of them is a marionette puppet museum, called “Welt Der Marionetten – World of String Puppets”. Walking in between its old walls on cobbled streets takes you back to medieval age. Visit small churches and old style buildings of this fortress. 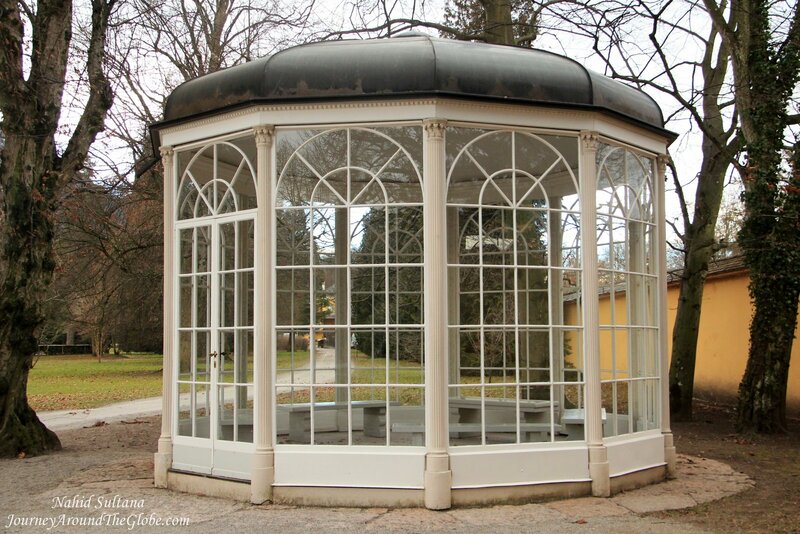 This is probably one of the best places in Salzburg to get a breathtaking panoramic view of the city. 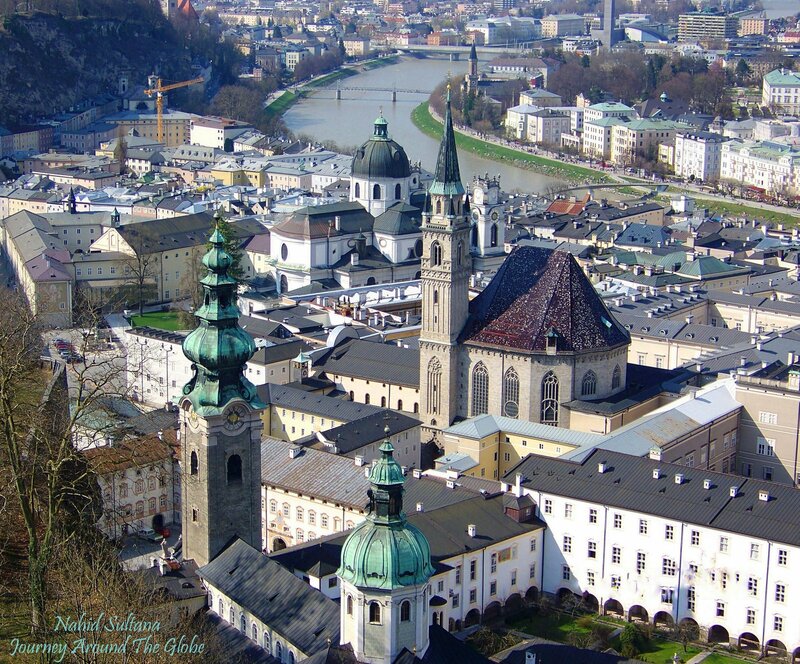 You can see River Salzach, steeples of many big and small churches, mountains in the distance, and the whole old town. We took a funicular or “Festungsbahn” to go up to the fortress. I am not sure if you can walk up there but that would be quite hard as the mountain is a bit steep. 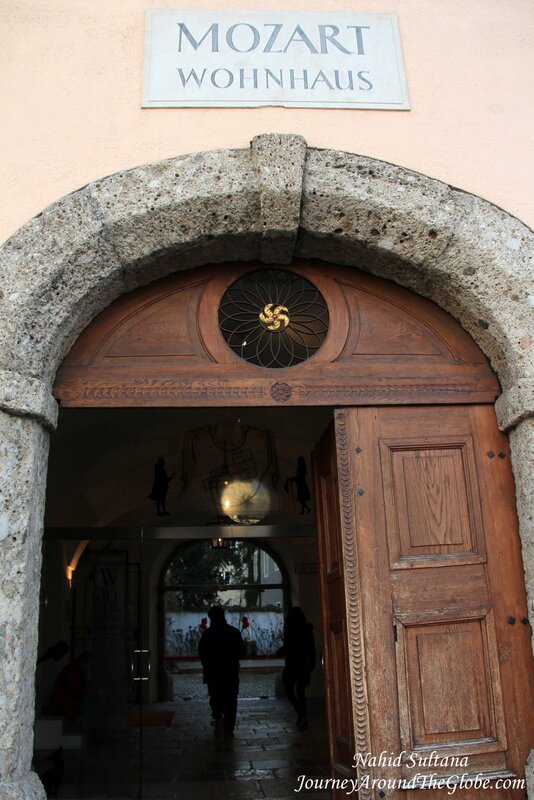 11) SCHLOSS HELLBRUNN: We didn’t really see whole of this place. 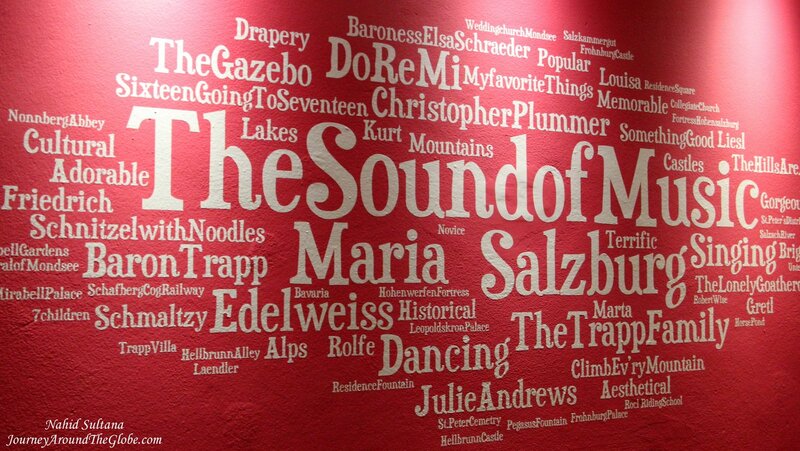 As I mentioned above that we took “Sound of Music” tour the day we visited Salzburg. Our tour bus brought us here to show the famous gazebo from that movie where the song “I am 16, going on 17” was shot. It was a short visit but looked very beautiful even in winter with some gardens and little parks. This was originally the summer palace of Archbishop of Salzburg. I am guessing you easily can spend half a day or a day strolling around the garden, parks, and fountains…a perfect place for families with children.